This article tells dog owners how much exercise dogs of various ages and breeds need, and how to get an overweight dog into an exercise routine. All dogs need exercise every day, all year-round. Depending on your dog's age and condition, he may need different amounts of exercise. If your dog is a puppy, he probably gets a lot of exercise just from bounding around and exploring new surroundings. Remember that a puppy's bones are usually still growing and somewhat soft. So his joints aren't as stable as they are in a full-grown dog. Don't make your puppy exercise or play right after eating. Usually, puppies sleep after they eat. Let them exercise at their own pace and stop when they want. Middle-aged dogs might need a little more encouragement to keep to their proper weight. And, for older dogs, moderate exercise is important not just for weight control but also to keep them limber and active. "If you think that your dog is overweight already, you should take steps to bring him toward a healthy weight." Make sure that your dog is being fed according to the lower end of the feeding guidelines that are printed on his dog food. You should make an extra effort to ensure he gets walks, runs, game playing, and other activities. Before starting a new exercise regime, you may wish to take him to your vet first to have him checked over, and discuss this extra activity. Start your dog off slowly, and work your way up to more intense activity. Look for signs of fatigue, and stop when you see them. Start with 10 minutes, and work your way up to a half hour or so over a period of several days or even several weeks, depending on how badly out of shape your dog is. Keep your dog in shape during the holiday season. For many of us, the holiday season is prime time to kick back, relax and enjoy good food. So it's a time when many of us put on weight. This is true of our pets, as well. Even pet owners who've gotten into a routine of giving their dogs exercise and good nutrition might slip during the holidays, when it's easy to give table scraps to the dog, and there are so many excuses to not take him out for a walk. Dogs can easily pick up some bad habits from their owners. That's one reason why overweight owners tend to have animals with a few too many pounds. It can be hard to resist the impulse to share holiday treats with your best animal friend. But, particularly if you find the holidays a hard time to exercise regularly, it's important for your pet's health that you stick to his normal feeding routine. 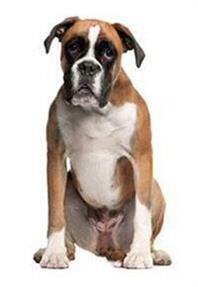 Not only can table scraps contribute to minor digestive problems, they also can contribute to weight problems.